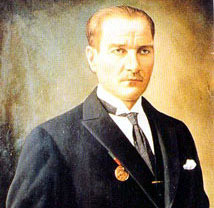 " M. Kemal Ataturk was an outstanding soldier and statesman of the first half of 20th century. " " The name of Ataturk brings to mind the historical accomplishments of one of the great men of this century; his inspired leadership of Turkish people his perceptive understanding of the modern world and his boldness as a military leader. profound changes initiated since then by Turkey and Ataturk. "